Practice Control Systems questions and answers for interviews, campus placements, online tests, aptitude tests, quizzes and competitive exams. This set of Control Systems Question Bank focuses on “Preliminary Considerations of Classical Design”. Explanation: The important point to keep in mind for designing control system are the transient response and steady state response as for designing a control system both of the responses are used in detail. . Explanation: Steady state error is the error that is specified as the time approaches infinite and value approaches the final value and specified mainly in terms of error constants that are mainly position, velocity and acceleration error constants. Explanation: Transient response is the response taken at any particular time during analysis and that is mainly specified in terms of damping factor and speed of response that is mainly settling time and rise time. Explanation: Relative stability is the measure of stability of a particular control system with respect to some reference and is measured both in time and frequency domain as in time domain it is the measure of damping factor and maximum peak overshoot. Explanation: Relative stability is the measure of stability of a particular control system with respect to some reference and is measured both in time and frequency domain as in frequency domain it is the measure of both resonant peak and phase margin. Explanation: The value of rise time must be less so that the speed of response of control system must be large and it depends upon the rise time, settling time and natural frequency. Explanation: The speed of response is the time to get the final response and in frequency domain it depends upon the resonant frequency the frequency at which the resonant peak is obtained and bandwidth. Explanation: Compensator can be of any different type but mainly electric network serves as the compensator. Explanation: Compensator are the devices used in frequency domain so as to get the desired response and there are various methods to place the compensators in the system as cascade or series or feedback or parallel. 10. Lead compensator speeds up the transient response and increases the margin of stability of a system. Explanation: Derivative compensation are also known as the lead compensators are these make the speed of response of the system more and also the bandwidth and hence make the system more stable. 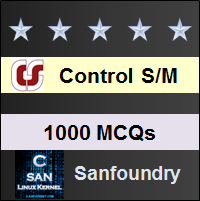 Sanfoundry Global Education & Learning Series – Control Systems. To practice Control Systems Question Bank, here is complete set of 1000+ Multiple Choice Questions and Answers.